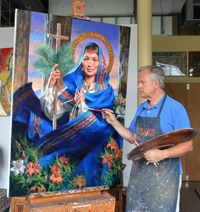 Originally commissioned by the National Museum of Catholic Art, Kevin Gordon's 54" by 39" oil portrait of St. Kateri was the featured altar piece at the canonization ceremony at the 10,000 seat shrine of Our Lady of the Martyrs in her home town of Auriesville, New York. It was also exhibited at the Italian Embassy of the United States in Washington, DC, where it was blessed by Donald Cardinal Wuerl Arch Bishop of Washington and praised by Miguel Diaz US Ambassador to the Holy See. St. Kateri is depicted in the Mohawk Valley of what is now New York State shortly before she departed for Canada. Her face is scarred by the smallpox which ravaged her as a child, and killed her Mohawk father and Algonquin mother. The red face paint on her forehead acknowledges her mother. Algonquin women applied red paint during special occasions. St. Kateri was a member of the Mohawk Turtle Clan, and wears a turtle amulet necklace. That and the simple shell earrings were her only adornment and even those she ultimately abandoned. She wears a simple white cotton trade shirt given to her by the Jesuits. In her right hand, St. Kateri holds one of the simple wooden crosses she made and placed around the forest as a testament to her faith. She also holds branches of the white pine tree, the traditional Iroquois symbol of peace. St. Kateri wears a "Jesuit ring", made of brass and engraved with religious symbols, given to the Indians by the priests. In her left hand, St. Kateri holds three strands of wampum. As well as being traditional sacred beads used for many ceremonial purposes, the three strands shown here represent the Holy Trinity. Her hand also grips the blue blanket or matchcoat which was part of her daily apparel. The traditional Indian beadwork and ribbon pattern is also found in drawings of 17th century Mohawk woman by Father Claude Chauchetiere. Because she was nearly blinded by her childhood smallpox, sunlight was painful for her and St. Kateri would normally cover her head with the blanket to shield her eyes. The design in the halo around her head is the traditional Iroquois Sky Dome motif, which represents the celestial world, our world and the world of darkness. 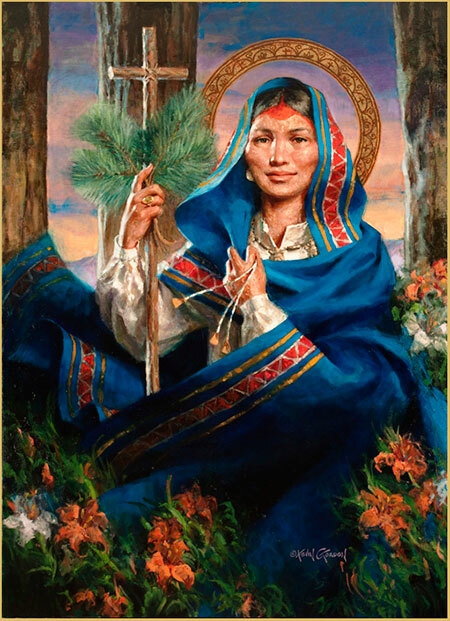 St. Kateri is immersed in the natural world, and stands resolute as she is buffeted by the Mohawk Valley wind just as her faith sustained her in the trials of her life. The lilies surrounding her are found throughout central New York State, the birthplace of the saint who is known as the "Lily of the Mohawks".